Tommy Keene is a singer/songwriter/guitarist originally hailing from the Washington D.C. area. He started his solo career in the early 1980’s-releasing an LP and two EP’s, with 1984’s “Places That Are Gone” getting a glowing Rolling Stone review. From there it was off to the races. Geffen records came in and released 2 records and another EP which culminated in “Based On Happy Times” which showcased his matured songwriting ability in a crystal clear production. But this was the first release without his band, and with shake-ups at Geffen, a more independent route on respected “Indies” like Matador would follow. 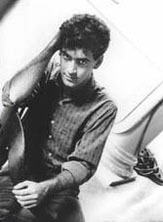 The new Tommy Keene band emerged in 1989 and featured bassist Brad Quinn and drummer John Richardson, who are with him to this day. In addition to producing solo CD’s that always seem to take bittersweet guitar rock to the next level, he has also found time to work as a “sideman” with other artists either on tour or in the studio-including The Velvet Crush, The Goo Goo Dolls and Paul Westerberg to name a few. (The Goo Goos even covered Keene’s “Nothing Can Change You”-it’s the B-side to the “Slide” single.) Keene was once called “the thinking man’s Replacements”. If that means something to you, please read on, but Keene’s music conveys so much more than that image. When artists as disparate as Fugazi to R.E.M’s Peter Buck sing your praises, this is obviously an undiscovered gem (for new fans) worth uncovering. To celebrate the release of his new CD-“The Merry-Go-Round Broke Down”, Tommy was gracious enough to answer some of my questions below. But don’t just take my word for it; check him out later this year when he hits the road on a new tour that’s coming to your town soon. E.C. : Let’s start with the new CD-The Merry-Go-Round Broke Down. When did you begin writing new songs for it and how long did the entire process take? Tommy: I started writing new songs in the fall of 98 and finished the music around the summer of 99 and then took some time off and finished the lyrics around the end of the year. All during the process I was also listening to all the live shows that were recorded in 98 for the live album Showtunes and decided that we needed to record a few more as there were versions of several songs we hadn’t gotten. So after doing a tour of Spain in February 2000 which took a lot of planning and organizing, we booked some shows in June of 2000, of which the two nights at Iota were subsequently recorded. So after mixing the live album in November of 2000 we reconvened in Tempe in December to do the basic tracks for TMGRBD. I recorded all the vocals myself in January 2001 and returned to Tempe for short visits in February and March to finish the guitars. Initial mixing was completed in April at Private Studios in Champaign IL but I felt the record wasn’t finished so after I re-recorded some things and tinkered with “The Final Hour” a bit, the final mixing was finished in August 2001. Things happen very slowly in TommyKeeneLand and 9/11 and other scheduling factors delayed the eventual release until June of 2002, I had hoped to have it out in the fall of 2001. E.C. : What were you hoping to accomplish with the recording of “Merry” that you hadn’t been able to do with previous efforts? Tommy: Without re-inventing the wheel I usually try to just write songs that satisfy me, that get me excited. The idea of “The Final Hour” popped up near the beginning of the writing process and I knew that it would be the centerpiece of the record and the biggest challenge. Other than that I also wanted to incorporate some new sounds and instruments hence the horns on a few songs. E.C. : “Merry” marks the 5th release that features your long-standing partnership with Brad Quinn on bass and John Richardson on drums. Can you describe how this “group” first got together and why do you think the collaboration has lasted so long? Tommy: When the original TK band slowly evaporated one by one I made the last Geffen record with the two engineer/producers at Ardent studios in Memphis, John Hampton and Joe Hardy. So to tour I had to put together a new group. I had met Brad Quinn when we played in Birmingham AL and struck up a friendship. I went on to produce his band’s record (Carnival Season). John, I met through a guy in Champaign IL who also introduced me to Adam Schmitt, who was in the process of getting his own record deal with Warner Bros. Honestly I can’t believe that we’ve played together this long, it’s difficult to keep a group together financially at this level. E.C. : They are obviously the core while other musicians have come and gone, especially in the rhythm guitar role. Do you ever see someone stepping in and grabbing the “bull by the horns” so to speak in this position? I noticed Steve Gerlach has recently made it onto 2 CD’s in a row. Tommy: Well Steve is an amazing guitarist who has his own group in Chicago so he’ll probably be moving on soon. But realistically, I can’t really afford to tour that much and making the records usually requires only a week or two of their time so it’s not as if it’s a full time gig. E.C. : “Merry” is truly a strong, melodic CD that kept me engaged the whole time. I’m sure many long-time fans will notice some new musical textures that you haven’t utilized on record before (sax and various horns for example). Was this a conscious effort before you started recording or did it just “flow” from the sessions? Tommy: I knew I wanted to put horns on “The Man Without A Soul” beforehand and the sax solo in “The World Where I Still Live” was something I did partly as a goof and partly because I didn’t want to hear another TK guitar solo. So there is a bit of irony in there which some people might not get (Big Man Assistance Please!) But it comes and goes before you know it. When re-mixing “The Final Hour” Jay Bennett and I made a sound collage with mellotrons, feedback, and various random noises which we dropped into the mix where we felt it needed some spice, so those were a lot of happy accidents. E.C. : Some return players from your “Isolation Party” CD contribute to “Merry” as well. What do Jay Bennett (ex-Wilco) and Jesse Valenzuela (Gin Blossoms) bring to the table on a Tommy Keene song? Tommy: Just their personality mainly, I’d like to have even more people do guest spots on records, although timing and various schedules don’t always permit it. E.C. : Describe how the songwriting process works for you. Does the music come first and then the lyrics? How hard or easy is to produce a song? Tommy: Almost always the music come first or a riff or chord sequence and then the song sort of writes itself and then I complete the lyrics. One time that I remember where I wrote lyrics first or came up with the title was for “Places That Are Gone”. It just came to me in a bar one night. E.C. : The last time that I’m aware of a songwriting collaboration between you and another musician that officially made it onto a Tommy Keene CD was “When Our Vows Break” with Jules Shear (from Based On Happy Times). Is there anyone you would really like to write a song with that could work for one of your records? Tommy: A lot of people, but the problem with co-writing is the other person has to be willing to offer or give up one of their good ideas and usually most people want to save that for their own records. E.C. : Looking back on your recording history for a minute. What record do you think was the most satisfying for you-on both a writing and guitar playing level? Tommy: Guitar playing, definitely the new one, because as you can hear I went pretty over the top. I still think my favorite album is Based On Happy Times, it just has some of my personal favorites on it and I think the recording sounds great, plus I had a lot of fun making it. E.C. : How about any particular songs that stand out? I know they’re probably all special to you. Tommy: With each album there’s one or two that feel that way the first time you listen to the final mix in the studio, starting with “Back To Zero Now” on up to “The Final Hour” off the new one. E.C. : “If You’re Getting Married Tonight” (from Ten Years After) is still a very memorable song for me I guess since it was in a more acoustic setting. Live I’ve seen you play acoustically for a few tunes but would you ever consider recording a strictly acoustic CD? Tommy: Maybe, but I think over the length of an entire record that would bore me but I wouldn’t be adverse something of a more stripped down record that would still have a few rockers. E.C. : The past few years (1998-2002) have seen you moving from three different record labels-Matador to Parasol and for “Merry”-SpinART records. Has this been distracting at all from playing and performing? Or was this more by choice? Tommy: It’s all distracting! I’ve assumed more of the roles like record company, tour manager, producer, engineer etc, than I’ve wanted to in the past few years. But unfortunately that’s what I have to do to keep things going. I didn’t sign with Parasol; I did what they call a P&D deal where they just distributed the record. Also all three Matador records were one-offs as is the new one on SpinART. E.C. : SpinART’s roster seems to feature more artists that value the art of songwriting more than anything else. Is this a better fit for you to be with artists such as John Doe and Bill Janovitz (to name a few)? Tommy: They have more of a Pop/rock roster for lack of a better term so that appealed to me. E.C. : At what age did you first start playing music? Did you ever consider a career in anything besides music? Tommy: I started on the piano at 7, guitar and drums a few years later. I was thinking of trying acting for a while in college but no unfortunately for me I’ve never thought of anything else. E.C. : Do you remember the first rock concert you went to? Tommy: Sure, it was The Dave Clark Five with opening act Neil Diamond at Constitution Hall in DC. July 1967, my Dad took my brother and me. At the same venue over the next few years I saw The Beach Boys, The Buffalo Springfield, The Who, The Loving Spoonful and The Box Tops among others. Led Zeppelin at Laurel Race Track summer of 69 was also a big one. E.C. : Do you think that being on an independent label allows you more freedom in your career? I know that in addition to your solo efforts, you have been able to spend time playing guitar and/or recording with other artists like The Velvet Crush, The Goo Goo Dolls, and Paul Westerberg. Does this help to bring a fresh attitude into the mix when you head back to your solo work? Tommy: Well, playing with two of those acts paid for Ten Years After (guitar with The Velvet Crush) and Isolation Party (guitar with Paul Westerberg in 1996). Unbelievably, I have a triple platinum album from The Goo Goo Dolls for playing on the song “Broadway” on Dizzy Up The Girl-RIAA plaque and all. Basically I’d like to play and tour with as many people as I can. I’m available. E.C. : I really enjoyed seeing you play guitar on Paul Westerberg’s 1996 tour. What was more fun for you-playing onstage with him or opening for The Replacements on the “Don’t Tell a Soul” tour? Tommy: Probably more fun opening for them because we then could go out and watch them every night. Doing the tour (1996’s Eventually tour) with Paul was fun and interesting to be a part of a big successful tour that played big house, got a lot of press and included luxury hotels and tour buses. E.C. : Who are some of your musical influences? In the past you’ve covered groups like The Who and Mission of Burma. Are there any other artists that have made a lasting impression on you and your music? Tommy: Too numerous to mention, the typical responses being The Beatles, Stones, Who and many others. The songs I’ve covered on my records usually came about because the cover in some way or another added a bit of variety to the record or was something that I never would have come up with. A perfect example would be (Alex) Chilton’s “Hey Little Child”. It’s basically a throwaway song but it’s got this great drum beat and has two chords. We used to do it live and just decided to record it one day. Same with “Kill Your Sons” (Lou Reed). If one was going to just cover an Alex Chilton song you’d have to pick a classic from one of the three Big Star records. E.C. : What’s been the most enjoyable concert that you have ever played? Also, what was a concert performance that you would like to forget? Tommy: The most exciting certainly was in 1983 when we opened for The Stray Cats at The Baltimore Civic Center in front of 13,000 people, probably the only time I’ll ever play an arena. There have been one or two horrible shows over the years but I’d rather not name them. E.C. : What new music are you into now? Tommy: I really like The Hives and the other pseudo-garage bands that have sprung up. E.C. : I know that you are originally from the Washington DC area and that’s how I initially discovered your music. Do you think that the DC music scene helped you to persevere for so long? Most of the other artists from your time frame (early to mid-1980’s) from here have slid off to the sidelines; Fugazi being one notable exception. Tommy: Well I’ve lived in California for 14 years now so my connections with the “DC Music Scene” are all but severed. I’ve hung in for a while yes, I guess I’m a lifer to quote something I read Frank Black say once. E.C. : Tommy thanks again for taking time out to talk with me. I know I speak for all your fans that we’re really excited about “The Merry-Go-Round Broke Down” CD. I hope you will keep writing great songs for a long time.